Lower back muscle pain is a very common cause of symptoms in the lumbar region. 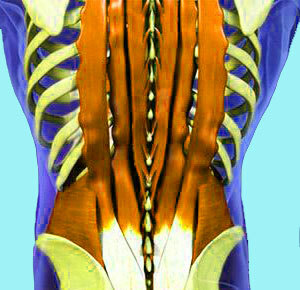 Many muscular pain syndromes feel spinally-motivated, but actually do not originate in the backbone at all. This is especially true of wide-ranging pain syndromes that seem to involve the entire lower dorsal region, as is so commonly reported by suffering patients. Muscular low back pain is certainly the most commonly reported type of dorsalgia and is also luckily the least clinically significant. Most cases will not require any professional treatment intervention, although some soothing words on the innocent nature of the pain will go a long way towards providing relief in the expected time frame. Chronic muscular pain is a completely different story and usually defies logical diagnosis, instead being blamed on often far-fetched inventions of opportunistic caregivers who see a sheep ready to be financially slaughtered. This simple and straight forward resource section profiles a comprehensive view of the most common varieties of muscular lumbar pain syndromes. We will examine the underlying causes of these conditions in the essays provided on each subtopic below. If you have lower back pain of a muscular nature, this section will help you to better understand and treat your symptoms with minimal risk and virtually no monetary investment. The lumbar muscular architecture is complex, multi-layered and completely mutually inter-dependent with the muscles of the hips, buttocks, legs, and throughout the remainder of the back and neck. All of these tissues work together to provide for and maintain our posture, which is why they are called postural muscles. Of all these tissues, the lumbar and buttocks muscles work the hardest. Additionally, most of the physical functionality that humans enjoy is created by a complex series of relationships between these various muscle groupings. Muscular pain can be caused by injury, tissue degeneration, scar tissue, ischemia, disease, mechanical interactions and other factors. The vast majority of muscular pain conditions are either enacted by known actual injury, known perceived injury or mindbody process. Rarely, more clinically significant types of muscular lower back pain can occur and these circumstances might warrant professional medical intervention and even the possibility for necessary surgery, such as in the case of tissue detachments. Lower back muscle imbalances have seen a huge increase in the incidence of diagnosis in recent years. Muscular imbalances can occur, but are quite rare and certainly do not often produce the types of dramatic and wide-ranging symptoms blamed on them. Lower back strain describes minor soft tissue injury to the muscles, tendons or ligaments in the lumbar region. Back muscle sprain is a similar diagnosis involving trauma to a specific muscular tissue. Lumbar muscle spasms can be horrendously painful when they recur. Spasms can force any patient into bed and onto powerful pain medications. Are your low back muscles always tired? Why do you think this occurs? We provide some enlightened answers that might surprise you. Pulled lower back muscles can be acutely painful when they first occur, but most do not require medical care and can be tended to with basic home remedy applications. Tight back muscles might occur after periods of intense labor or strain, but chronic tightness is a completely different matter, as we detail in this interesting essay. A stiff lower back might be created by muscular or spinal issues, or through various nonstructural processes that can affect blood flow or nerve signaling ability. Aching back muscles might not indicate any problem or may be indicative of a dorsalgia condition. How can you tell “good pain” from “bad pain”? Sore low back muscles are to be expected after working out, exerting yourself physically or during endurance activities. Injured low back muscles will heal if given the chance. The problem is that some patients continually reinjure their muscles and put themselves at risk for the development of RSI. Hamstring lower back pain study focuses on the cause of pain through tight hamstrings, as well as the effect of tight hamstrings from lumbar pain syndromes. This is a classic study on cause versus effect. We virtually always recommend icing muscular pain issues for the first 24 to 48 hours, depending on severity, then applying heat thereafter to speed recovery and increase functionality. Patients are encouraged to gently move the area and not to simply recline motionless in bed, as this action will retard the healing process. Use of OTC drugs is acceptable, but does come with risks that should be considered. It is far better to utilize methods of pain management that are not damaging to the general health, such as acupuncture, meditation, pain coaching and massage. We provide complete guidance on lower back pain home remedies elsewhere in this website and suggest that patients whose pain does not ameliorate within a few days should seek consultation with a qualified medical provider. Chronic lower back muscle pain is difficult for traditional medical science to cure, but our proprietary pain relief program has cured tens of thousands of people with these severe symptoms. 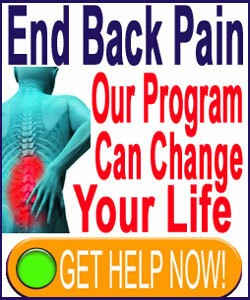 You can learn more on our Cure Back Pain Forever product page and get help immediately.